Home page Information For Home Sellers Use the Builder’s Plan? Can You Just Use This Builder’s Plan I Have? Before using it, I’d need the owner’s express written permission and sourcing out the owner may not be easy. The owner is most likely the architect who drew it, but could also be the builder or the developer if the copyright was transferred by written agreement. Using the drawing without written permission is copyright infringement. Since I have an expectation of people respecting my intellectual property, I am not keen to disrespect someone else’s. WHENEVER the plans were created .. its likely they are not accurate. They MAY have been accurate when building began, but during construction “things change” and those changes may or may not be reflected in the copy of the plans you have now. Builders frequently add custom built-in cabinetry during construction. The built-in entertainment center that covers one whole wall in the Family Room has 24″ wide bases with cabinets, topped with recessed 12″ wide adjustable shelves. The builder’s floor plan says the room is 20′ x 15′ . HOW was that measured? Was it 20′ before they put in the 24″ built-ins or after … so is it actually 18′ and not 20′? Do you know? Me … I don’t like to guess on things like that … when I measure it I KNOW what I did and show it to you in the RoughOut. [Link to The RoughOut] So, if I have to show up onsite just to measure what the original builder’s plans may or may not show, and figure out how it all was measured — it’s really a heckuva lot quicker and easier just to SMARTePLAN it. The builder’s plans aren’t that GOOD. Seriously. 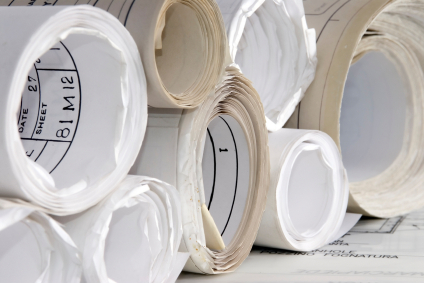 If they are a copy of the actual builder’s plans … they are oversized and difficult to read with important information contained on several different pages .. and storing them rolled up in the attic for a few years hasn’t exactly made them easier to read. The marketing plan diagrams may be a little easier to read, but we still have the issues associated with # 1-4 above that present problems with us using them. Let’s take a look at a comparison below. This is a rooftop condo near the Galleria. I’ve put the two side-by-side. Do you think a buyer may be interested in knowing the whole outdoor terrace is not concrete but is actually a custom multi-tiered wood-planked deck with a free-standing gazebo? Or that custom rail lighting is in the unit? 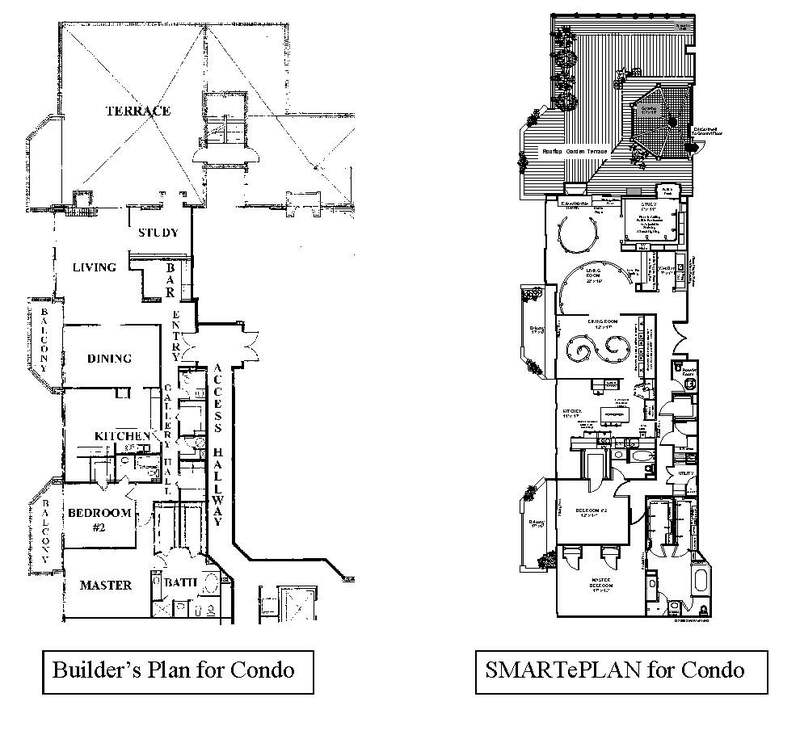 Or any number of helpful details that the SMARTePLAN shows and the Builder’s Plan does not. Now which one do you want representing YOUR property?